When I first started couponing, I made the mistake of not checking the store’s coupon policy prior to planning my visit. I did my shopping and organized all coupons with the items at the cash. Then I was told that the store didn’t accept Internet coupons. That threw my perfectly planned purchase into a loop and I ended up having to put a few of the items back. I left the store frustrated and disappointed. I turned a negative experience into a positive one though. As this was a learning experience and I was still new, I made sure to always check a store’s coupon policy prior to shopping. This way there should be no surprises at the cash and (hopefully) all will go smoothly. 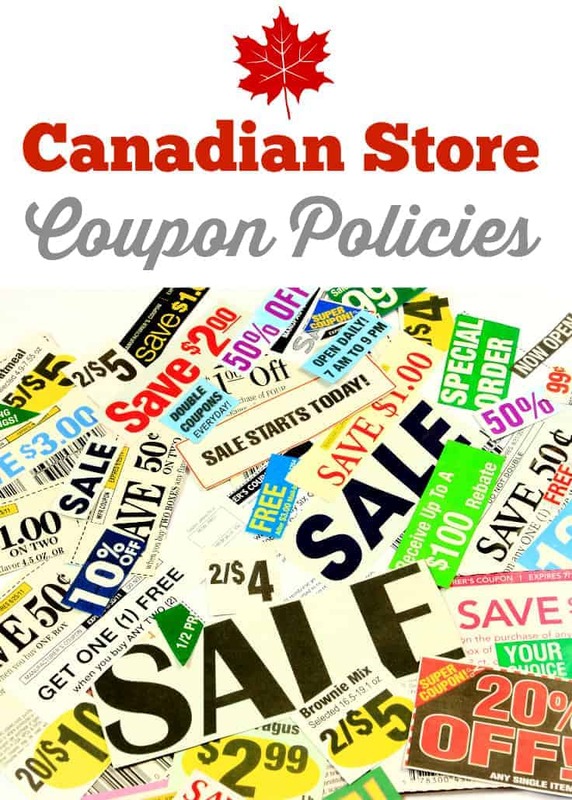 I decided to make a list to have as many Canadian store coupon policies in one spot that I could find for both myself to reference and for you too! I hope this helps you plan your grocery shopping purchases and saves you time (and money)! 1. No Frills: Accepts Internet coupons. 2. Walmart Canada: Does not have an official coupon policy and what is accepted will vary by store. 7. Giant Tiger: Accepts Internet coupons as well as Coupgon digital coupons. 8. Real Canadian Superstore: Accepts Internet coupons. 9. Metro: Accepts Internet coupons. Note Internet coupons for FREE products are not accepted. 10. Food Basics: Accepts Internet coupons. Note Internet coupons for FREE products are not accepted. 11. Shoppers Drug Mart: Accepts Internet coupons. Note Internet coupons for FREE products are not accepted. 12. Canadian Tire: Does not have an official coupon policy and what is accepted will vary by store. 13. Rexall: Does not have an official coupon policy and what is accepted will vary by store. 14. Pharmasave: Accepts Internet coupons. Coupons must have an expiry date. 15. Costco: Does not accept any manufacturer’s coupons including Internet coupons. 16. London Drugs: Accepts Internet coupons and also allows you to stack coupons on one purchase as long as the coupons are different. 17. Jean Coutu: Accepts Internet coupons. Note Internet coupons for FREE products are not accepted. Internet coupon must have expiry date within six months of the current date. 18. Longos: Accepts Internet coupons. 19. Safeway: Accepts Internet coupons. Note Internet coupons for FREE products are not accepted. 20. Save-On Foods: Accepts Internet coupons. 21. Valu-Mart: Accepts Internet coupons. It was nice to see that most of the stores on this list accept Internet coupons. The grocery store in my town is locally owned and operated and isn’t on this list. I wish they would start accepting Internet coupons too! Notice that some stores won’t give you free products with Internet coupons? Sometimes you can luck out and find a sweet printable coupon for a free product. It’s good to know which stores will be more likely to accept them. My one frustration is with Walmart Canada and their lack of coupon policy. Our local Walmart has a restrictive coupon (and ad matching) policy compared to other Walmart stores in Canada. I wish they would all be uniform so that I can’t have the same benefits as others living in different communities. Also, I notice the policy changes depending on which cashier you get. It’s frustrating at times when some cashiers give you a hard time and others are super helpful and nice. Did you see that Giant Tiger accepts Coupgon digital coupons? I’m going to have to research that more and see if I can use any to help me save money. I shop at Giant Tiger for groceries quite often. If you use coupons or want to start, bookmark or pin this list to save it for future references. Over time, you’ll get to know the coupon policies of the stores you frequent. Sometimes, it’s nice to get a little refresher. For more money-saving posts, check out 17 ways to save money on groceries, how to save money on groceries with Checkout 51, how to price match with flyers, 10 sites to find coupons online in Canada, how to save money shopping online and four apps to save money on groceries in Canada. Thank you so much for sharing this!! I was aware or some that you’ve listed, but completely unaware of others as well. So very handy! Nothing worse than needing to stick to a budget, relying on coupons….just to have a particular store completely throw you off. Last week I was refused an internet coupon from Shoppers Drug Mart because I was buying more than one of that item (2 deodorants on sale) and I had already used a coupon on the first item. The coupons were from different sources (websaver vs. smart source and for different amounts), but the store said 1 coupon per purchase… I found that very strange. Isn’t a purchase an item? It was embarrassing as the cashier called her supervisor and was the only cash open, so it caused a big line. Why? ive been trying to use coupons in my city for years.about the only place have not tried s giant tiger.so except for giant tiger I have yet to find any retailer or grocery store that will except mt printed coupons.walmart has been not to bad as far as mailed coupons.i have had only one negative experience with walmart were a cashier had called management and it was a big tado.i have also lost out on many free prodcts with coupons.i think no matter their policy(in my city anyways) regardless of what the policies are,they make the rules up on a case by case basis.i try every now and then with coupons,but to me its reall not worth the hassles anymore. I stopped shopping at our local Metro over their coupon policy that changed every week, their loss. Our local No Frills, Sobey’s and Giant Tiger have all taken internet coupons, I no longer print coupons only get them if they mail them as it’s a crap shoot if I will be able to use them as it seems to depend on whose working, and what the moon cycle is, so I no longer waste my ink. I’ve forwarded this info to my girls who also use coupons. This is good information to have. I’ve used coupons at many of these stores. I have had a number of problems with Sobeys with my coupons, but never one with Dominion or Walmart. Thanks very much for all the helpful information regarding different store policies for accepting coupons! Thank you Stacie for this great information.I will share this with my friends. Thank you for sharing Stacie! This is great information. I had some problem with Walmart in the pass but not lately. I think it depends a lot on the cashier sometime. Thank you for this summary! I didn’t know who accepted what. Thanks for the comprehensive list. I have trouble with internet coupons because my printer doesn’t always show the lighter print — therefore giving the store a reason to reject the coupon. Thank you for sharing this, it can be hard to keep track of all the different store policies. Thank you so much! This would help a lot. I always have a hard time keeping track of which stores will accept what. Generally I don’t have any issues at Walmart and Freshco, but there’s the odd times….